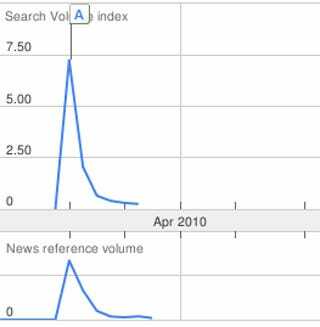 The hype Google Buzz generated when it launched has petered out almost to nothing. Matt McGee has a post up at Search Engine Land looking at data from ad network Chitika and elsewhere showing interest in Google’s attempt at a content sharing network falling off a cliff after its launch. Data on web searches, news searches, or news mentions all show the same thing: a lot of people wanted to know about Google Buzz when it launched, but most lost interest within a week or so. Of course, even if Buzz were a smash hit, we would still see some sort of spike like this; Google kept the new product under wraps until they were ready to roll it out, and the excitement — and, as it turned out, outrage — surrounding the launch obviously wouldn’t last. The real bad news here is that a month and a half later, interest in Buzz is still trending down. Now that the launch is no longer a news story, Buzz will generate buzz of its own only if its a product people use and care about. If searches for it down start drifting upwards again soon, that will be a very bad sign. See Also: Nobody cares about Google Wave anymore.